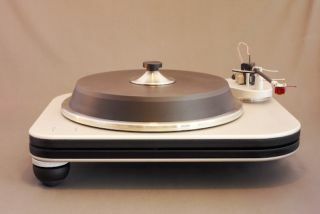 Spiral Groove SG1.2 turntable weighs 43kg and costs $30,000 | What Hi-Fi? Spiral Groove’s newest deck features various upgrades to the feet, platter and tonearm to make for an ultra-high-end record player. An update to the company's SG1 turntable, which was released in 2007, the SG1.2 comes with a new, heavier platter which claims to offer “a bit more focus and depth to imaging”. Spiral Groove says it delivers a “fast” sound and a lower noise floor than before. Allen Perkins, president of Spiral Groove, said “even pops and ticks seem quieter, I believe, because of the platter material and internal shape”. New isolation feet have been fitted, based on the design of the company’s Strange Attractor isolation feet, and the whole turntable has been made using Spiral Groove’s Balanced Force Design. This is said to achieve the “most elegant equilibrium of materials, performance, function, manufacturability and beauty”, no less. The main body is made up of two platforms, separated by elastomers that mechanically decouple them. This helps to form a rigid and well-damped platform. Speed control is electronic between 33 1/2 and 45rpm, and the low voltage/high-torque AC synchronous motor is decoupled from the deck to help minimise noise interference. The platter has an inverted sapphire disc/hardened steel bearing and platter assembly. Finally, the tonearm mounting board is fitted with a stainless steel bayonet mounting system that allows users to easily remove it at the push of a button. This means multiple arm and cartridge combinations can be swapped and installed for different types of music. The upgrades over the SG1.1 add up to a combined weight of 20lbs (approx 9kg), bringing the overall weight up to 43kg (still lighter than this cast iron turntable).